Ripe juicy tomatoes are just falling off the vine in our backyard garden right now. There are bags full to pick every day. So that means it's time to get creative. Of course we've already enjoyed BLTs and my husband's memory has been refreshed as to how much better his lunchtime sandwiches are with a slice of garden fresh tomato. We've also had fajitas, pasta with burst cherry tomatoes and some roasted veggie salsa. I also really enjoy a thick slice of tomato topped with cottage cheese and seasoned salt. No matter how fast we use them, the piles keep growing! So it was time to make a pie! In years past, I've made tomato slab pies with cornmeal crust that are delicious. This year I thought it would be fun to do a more traditional pie. So I broke out the pie plate and went to work. I sure am glad I did! 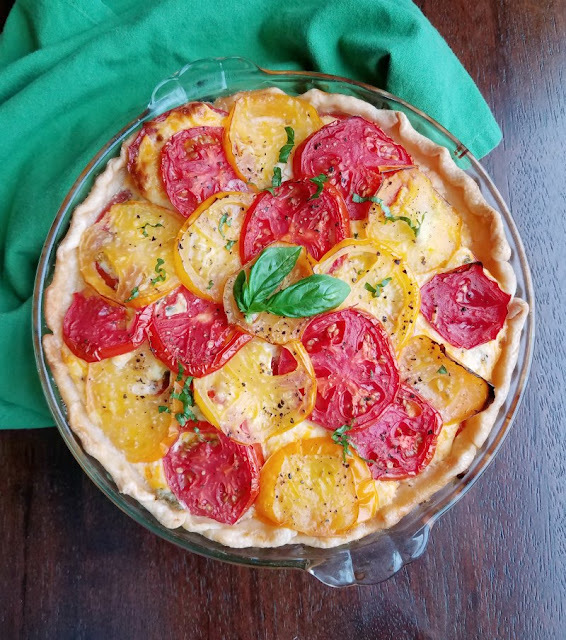 This pie tastes a lot like a tomato sandwich, but is so much prettier! I had a couple of pretty gold toned tomatoes, so I saved them for the top. The rest were big bright red beefy tomatoes. A few sprigs of fresh basil from the herb garden, plenty of cheese and an egg to help hold it all together and a thing of beauty is born! I am sure I'll spend a few evenings this week making tomato sauce to freeze. Then I'll be looking for more fun tomato ideas! Have you ever had a tomato pie? What are your favorite uses for loads of fresh tomatoes? Prepare pie crust and place in pie pan. Refrigerate until ready to use. Slice all but one of the tomatoes into thin slices, removing the seeds as you go. Spread the slices out over paper towels and sprinkle with a teaspoon of salt. Allow to sit and drain for 30 minutes. After 30 minutes, pat with an additional paper towel to remove any remaining moisture. Grate the onion into a small bowl. Stir in the mayonnaise, cheese, egg, vinegar, sugar and pepper. Chop the basil and chives and add to the cheese mixture. Sprinkle the cornmeal over the bottom of the prepared pie crust. Dollop 1/3 of the cheese mixture over the cornmeal, gently spreading it around. Arrange a layer of about half the tomatoes over the crust, then 1/3 of the cheese mixture. Add the remaining tomatoes and cheese mixture on top of that. Slice the remaining tomato and arrange over the top of the pie. Sprinkle with a bit more pepper and bake for 40-45 minutes, covering with foil about half way through. Allow to stand at room temperature for at least 1 hour before serving. Carlee, this Tomato Wonder is a Beauty! It sounds delicious and it’s just so darn pretty! Great job! Ha! More for the pie! Everything about this pie is screaming out to me!!! I may just have to make one this weekend...because keeping up with the tomatoes is a serious issue right now! Yay! I hope you love it and I feel you on the tomatoes. I've been making and freezing tomato sauce for the winter! I'm jealous of your tomato vines! This tart is sooooo beautiful!!! I seriously can't wait to make it. Our plants are huge and they are definitely producing right now. You are welcome to come pick anything you'd like! I hope you get a chance to make the pie! Oh, yum, I could eat the whole pie! Thanks for this recipe. It was so hard not to do the same myself! Luckily both my guys liked it, so I had some help! I love that you used the different color tomatoes. It always makes a tomato pie look so mouthwatering. 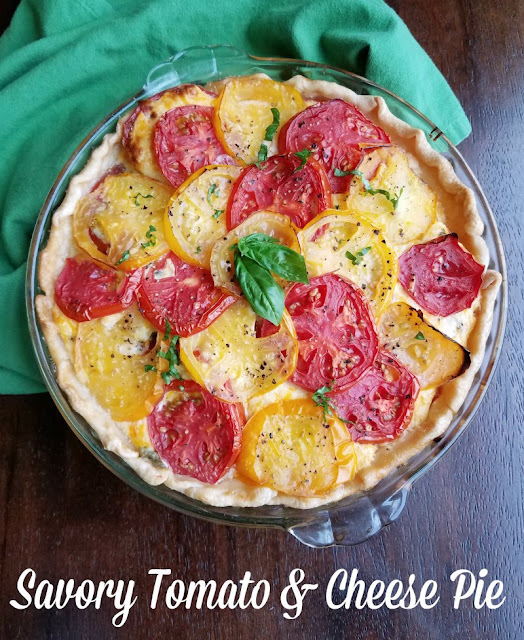 I love me a tomato pie and I love all the different colored tomatoes you used. Thanks Carlee. This looks so scrumptious! I love that it's so simple to make, too. It really is simple and stunning, isn't it? Thank you! 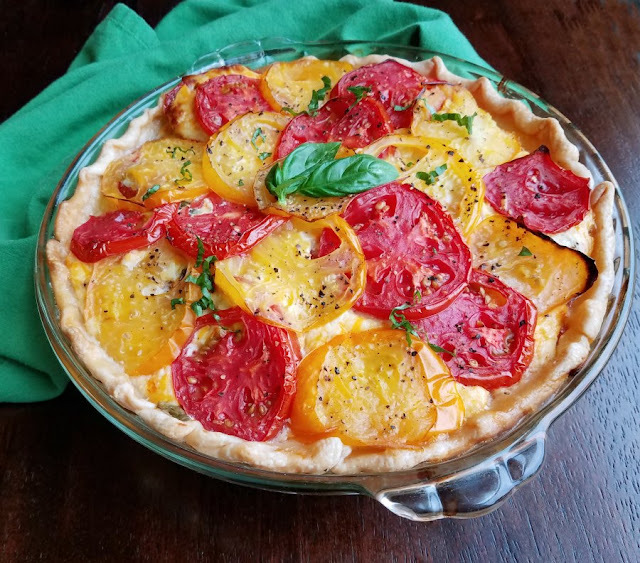 I love that you used both red and yellow tomatoes, makes it so pretty. Sounds tasty too. The two colors really do add something, don't they? Thank you! Ok- I love this- I have all the tomatoes and wanted to make a pie- this would make a fantastic breakfast! I would never have thought to use mayo! It would make such a fabulous breakfast! Now I want to have a slice with a fried egg on top! It's funny how they always seem to all come on at once! I have never had tomato pie. I can't wait to give it a try! So much flavor and color in one pie. I can't wait to this my market for tomatoes to make this. Mmm! What a great way to use them! Hi Carlle, this looks good and you can't beat the taste of home grown tomatoes straight off the vine... My favorite thing to do with tomatoes in summer is a simple tomato and basil sauce served on pasta and topped with plenty of melted cheese. It's the taste of summer. That does sound perfect! It is really hard to beat a fresh homegrown tomato, isn't it? I saw you featured on Full Plate Thursday this week. This pie looks delicious! I have a number of homegrown tomatoes and was thinking about a pie, but had never made one. Thanks for this! I've made slab pies quite a few times, but I figured it was about time I make an actual pie. I am so glad I did! 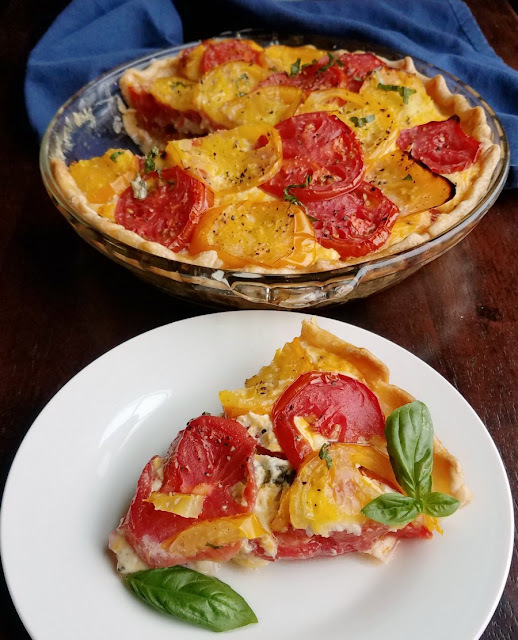 Your post is featured on Full Plate Thursday this week plus I have it on my Whats For Dinner Next Week on Saturday night. Thanks so much for sharing your talent with us and have a wonderful week! This is perfect to make for a dinner party, it will definitely impress guests, so pretty! I agree completely, thank you! It looks almost too beautiful to eat! 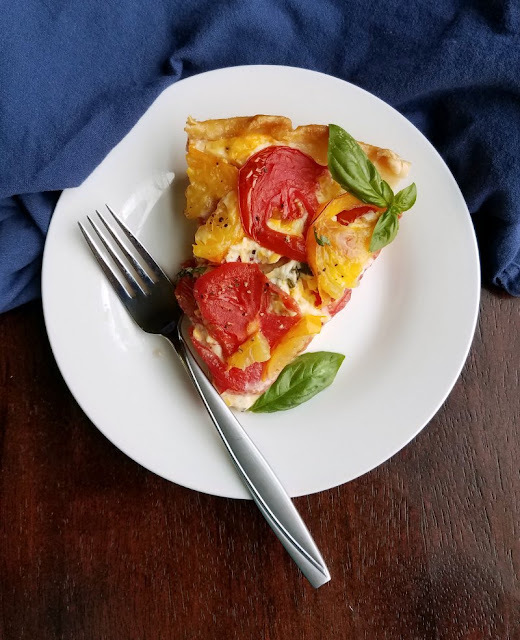 A delicious way to use up the end of season tomatoes.